"I've Got to Follow Her"
Karen Lodrick ordered a latte at Starbucks while waiting nervously for the bank on San Francisco's Market Street to open. She had been anxious and distracted of late but couldn't help noticing the scruffy-looking pair standing next to her: a tall man wearing a navy baseball jacket and a large woman in jeans and Gucci glasses, carrying a brown suede coat and a Prada purse. The woman looked vaguely familiar. That coat. A cold tingle of fear ran through Karen as she took it all in. The distinctive faux-fur trim along its edges looked as unkempt as the woman who held it. And then -- bingo -- she knew. Karen's ID had been stolen five months before. Her bank account had been emptied, and her life sent reeling out of control. The coat she was looking at was the same one she'd seen in the bank surveillance tape, worn by the woman who'd stolen Karen's ID. Karen followed the pair onto the patio and watched as they settled at a round table under a burgundy window awning. She called 911, asked that a police officer meet her, then settled at the next table, watching and waiting on this morning in April 2007. Just the day before, Karen's bank had called after closing hours to tell her that she'd left her driver's license at a branch on Market and Church streets. But Karen had never been to that branch. And her real driver's license was still in her wallet. The con artist must have come back to retrieve the phony license. A cell call from her friend Ed Fuentes interrupted her thoughts. She walked toward the hedges that bordered the Starbucks patio, out of earshot of the pair, and told him her suspicions. Ed, I've got to go ... I've got to follow her. The large woman and her companion stole glances at Karen, looking increasingly nervous. Then they got up from the table and separated. The man turned south. The woman headed north. "Ed, I've got to go," she told her friend. "I've got to follow her." "Don't do anything crazy, Karen," said Fuentes. "She could have a gun." "I've got to do it." She feared that if she didn't act, the identity thief would disappear, along with any hope of ending her bad dream. The chase was on. For five months, the thief had dipped into Karen's accounts like they were her own private piggy bank. She scammed thousands of dollars more, using credit cards she opened in Karen's name. The banks were unable to stop her. The police could do nothing. Creditors demanded payment for the thief's transactions. Karen closed her accounts, only to have the criminal crack open the new ones she'd opened and drain those too. The woman turned a corner. Karen's phone rang. The caller ID said "unknown caller." Karen looked up the street and saw that the woman had her cell phone out. Could she be checking to see if the real Karen Lodrick was on her tail? And where were the police? As Karen approached a recycling center at the corner of Buchanan Street, a man stood looking quizzically at her, then at the woman she was following. "Do you know her?" she asked. Karen told him she thought the woman had stolen her identity. "You're not the first person to say that about her," he said, arousing her suspicion about him as well. Was he an accomplice? Karen again called 911 as the woman took off up the hill, looking over her shoulder at Karen every few seconds. "I need somebody to come to Buchanan and Market," Karen told the 911 operator who answered. "She is running. I need the police." "This woman has been taking my identity. For the last five months. It's been a living hell." There was an odd voice mail from Karen's bank waiting when she returned home to San Francisco in November 2006 from a family reunion in Michigan. Karen called back, and the service rep asked if she'd made any large withdrawals and mentioned one in the amount of $600. Karen assumed it was a bank error and asked the rep to verify the debit card number. "That's not my card," she said. The bank representative insisted -- mistakenly, as Karen later learned -- that someone had called from Karen's phone to order the new debit card. After much back-and-forth, Karen convinced the rep that it wasn't hers, and he canceled it. What he failed to mention was that a second new debit card had been issued on her account. And it was still open. Concerned after the bank rep told her the order came from her home phone, Karen asked her neighbors if they'd heard about any break-ins. They hadn't. But several people in her building mentioned that they'd seen mailboxes hanging open. A thief had apparently broken into the mail and stolen at least four envelopes: two with debit cards and two that provided the debit card PINs. As far as Karen knew, the thief had stolen $600. Bad enough, but not life-altering. It wasn't until she got to the bank, and a representative turned the computer screen around for her to see, that she understood what had occurred. Screen after screen showed dozens of withdrawals, just over the past few days. About $10,000 was gone. Karen's balance was zero. Her overdraft protection plan had automatically deducted another $1,200 from savings to cover the shortfall after the thief had cleaned out the checking account. Karen filed a police report, closed her now-empty account and submitted a claim. With no money to cover checks, she couldn't pay her bills, her rent. She couldn't even buy groceries. Late fees were compounded by black marks on her credit report. And that was just the beginning. At five-two and 110 pounds, Karen Lodrick was tiny compared with the nearly six-foot-tall woman carrying the brown suede coat. Block after block in downtown San Francisco, Karen chased the woman, keeping the 911 operator on the phone to let her know exactly where they were. She lost sight of the woman after she turned a corner. But as Karen looked through the French doors leading into a stately old apartment building, there she was again. One glance at Karen and the woman took off down the hill toward Market Street, a main thoroughfare with multiple lanes in either direction. Traffic whizzed by. Locals strolled the tree-lined sidewalks and walked in and out of funky coffeehouses. Some, toting bags of bottles and aluminum cans, meandered toward the recycling center. People of every description moved along Market Street. But she didn't see any police officers. As the identity thief passed an abandoned shopping cart, Karen saw her arm swing out. She tossed something inside. Karen raced to the cart. "I got what she dropped," she told the 911 operator. "It's a wallet. A Prada wallet." Karen wanted to look inside, but she had no time. The thief ran into a busy intersection against the light and flagged down a taxi. Karen panicked. "She is not going to get away," she cried to the operator. "I am not going to let her escape." She caught the taxi before the driver pulled out. "Don't let her go!" she implored. "She's an identity thief." The driver lifted his hands off the wheel and held them up. Her escape thwarted, the woman got out and confronted Karen. "Why are you chasing me?" For an instant, Karen felt doubt. What if this wasn't the thief? She tried to convince the woman to wait for the police. But she took off down Market Street again, toward Octavia, where the freeway spilled out its traffic. Karen kept after her. A vintage orange streetcar pulled up to the bus stop, and the woman jumped aboard, Karen right behind. Adrenaline pumping, she was totally focused on the thief. "Please don't drive away," Karen told the driver. The thief quickly ducked off again. "Why don't you just wait and you can talk to the police?" Karen called. To Karen's surprise, the woman answered, saying she was on probation and would be arrested. Karen now had no doubt she'd found the right person. It drove Karen crazy that it took about two weeks for the bank's credit card division to process the problem and recredit money to her account. She felt hopeful when the bank called to tell her it had a surveillance video of the thief. On it Karen saw a big, dark-haired woman in a suede coat and designer sunglasses at an ATM. 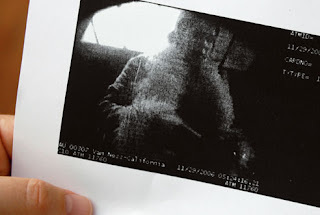 Karen signed an affidavit that she didn't know the woman, got a printout of her image, and that was it. Meanwhile, the thief reached deeper into Karen's life. She used her Social Security number and other information to get a counterfeit driver's license, showing Karen's license number but the thief's picture. With the license and the Social Security number, she reopened accounts that Karen had closed years before. One day, the Dell computer company called Karen to confirm that it was all right to send "her" $7,000 order to an address different from the one on her account. "Close that account and don't deliver those computers," she told Dell's rep, explaining someone had stolen her identity. She asked for the address the thief had wanted the equipment sent to. Dell refused to give her the address, saying she'd have to put the request in writing. Karen placed fraud alerts with the credit reporting agencies. But that didn't stop the thief from opening more accounts in Karen's name. Again and again, she asked the bank to put an alert on her account, but when she checked, it wasn't there. The thief got into her new bank account, and the whole cycle began again. She was at her wit's end. To add to her frustration, the bank claimed Karen had failed to come in to view the surveillance video. It didn't matter that she'd signed an affidavit. The bank couldn't find it and cut off access to her funds. She viewed the video again and signed another affidavit. The bank lost that one too. She signed another. Now, with a phony driver's license, the thief was stalking her third checking account. For half an hour, up and down the streets, around corners and into alleyways, Karen Lodrick, frightened but determined, pursued the woman with the suede coat. Karen lost her twice when she slipped into buildings to hide. And then she lost her a third time at an indoor parking lot. "It's over," she told the 911 operator. Exasperated and exhausted, Karen zipped open the Prada wallet. Two of her bank statements were tucked into one side of the large wallet. On the other were the two debit cards used to clean out her account in November. She also found one of her own paychecks. But what chilled her most were tiny "cue cards" with her name, Social Security number, driver's license number and address. The 911 operator assured her that an officer would be there as soon as he finished an emergency call, and Karen agreed to wait by the entrance to the garage. When the cop arrived a few minutes later, Karen told him what had occurred, feeling little hope that he'd find the woman now. But only moments later, the officer found her -- crouched between a car and the building, smoking a cigarette. "Idiot! You should have kept running," Karen told her. The arresting officer said the identity thief, Maria Nelson, had at least 60 prior arrests, was indeed on probation and was wanted in another jurisdiction for similar crimes. When Nelson came before a judge 44 days later, however, thanks to a plea deal with the prosecutor, she was sentenced to only time served plus probation.